Yesterday, Peter Durand had a face-to-face meeting with 20 young, fresh-faced Dutch students. Fortunately for them, it was via Skype and they were safe from his early-morning coffee breath. 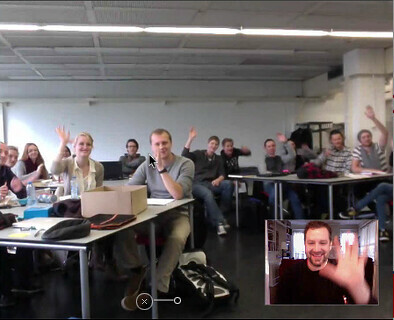 These industrial design students at Technische Universiteit Eindhoven (TU/e) in The Netherlands were critiquing the Alphachimp U. online course businessmodelstudios.com created in partnership with Business Models Inc. The design students were thorough, articulate, direct but polite. 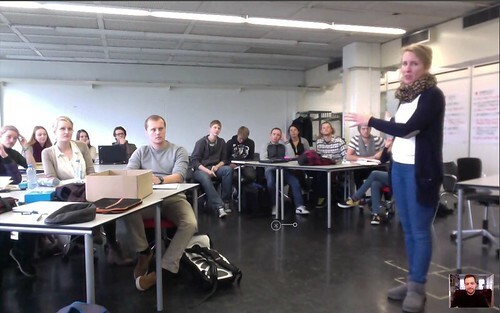 No doubt because the other person (who was physically in the classroom with them) was Camilla van den Boom, who is both a lecturer at TU/e and COO of Business Models Inc.
Camilla's students were given access to the online course as a way to further their application of the Business Model Canvas to real-world facilitation. In her graduate level course, the students dive deep into business model design. As part of the course, student teams produced various interactive case studies on the leader in affordable design, IKEA. Over the hour-long discussion, they delivered constructive feedback (The White List) and critical suggestions (The Black List) for the usage of -- and improvements to -- the online course, its user interface, pedagogy, and overall content. Peter gave them an inside view of the design challenges (for example, his ER visit during the filming of the videos) and the business decisions experienced in the production of the videos and tutorials. This is the spanking brand new website for Alphachimp University. Thanks for being here. Check out our online courses here.